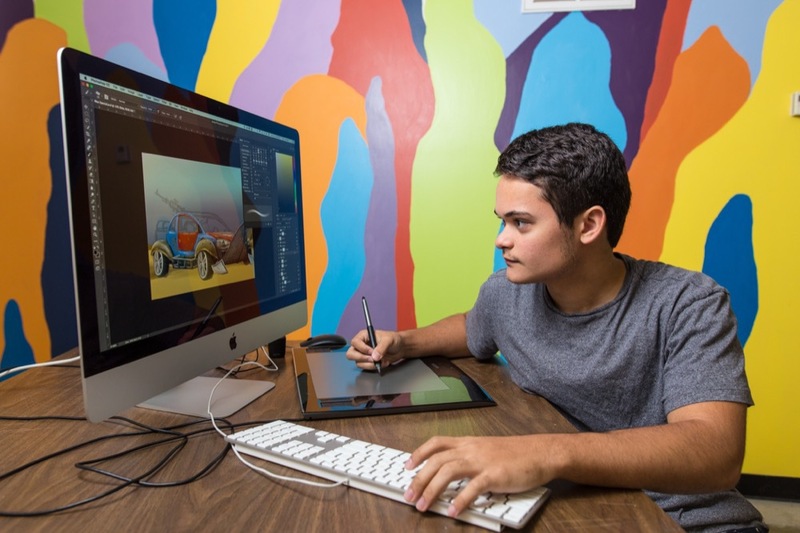 Having access to the equipment in the visual and communication arts (VACA) equipment room at Eastern Mennonite University didn’t just help Macson McGuigan with class assignments. It also helped him find his own style and jumpstart his career. It’s one of the beauties of this small university: Whereas a large university might allow students to check out equipment for a few hours at a time, VACA students at EMU can check it out for days on end – sometimes for longer projects, or even over breaks. 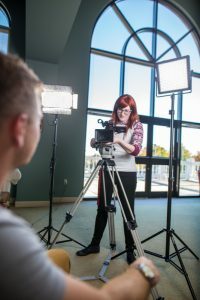 For McGuigan, who graduated in 2017 and now is a photographer and videographer for EMU and other clients, the equipment was what he needed for meaningful skill-building experiences. But as a VACA student McGuigan was also welcome to use the equipment for his own projects, including professional ones. He used a Sony Fs5 to film up to 16X slow-motion shots of bees, streams and owls (and Sony mirrorless cameras, LED lighting and mics to conduct interviews) for a client advocating for the protection of Shenandoah Mountain as a National Scenic Area with an embedded Wilderness Area. Lila Marks earned praise for her senior show, an exhibit of documentary photos related to the homeless and homelessness in Hawaii. Senior Adila Wahdat was selected for the 2016 International Antarctic Expedition with the 2041 Foundation. Matthew Gillis interned for National Geographic Adventure in New York City, the D.C. United soccer team and Oregon’s Statesman Journal. He was the winner of an Associated Press Photo of the Month, and now is an events photographer. Michelle L. Mitchell is an award-winning photographer for the News Virginian newspaper. 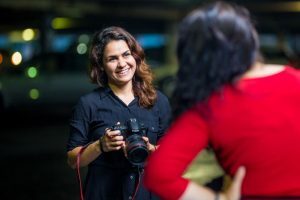 Kelby Miller is a promotion manager at SNN Local News 6, the only locally owned and operated television station in the Tampa-St. Petersburg-Sarasota market. Joel Landis interned at an advertising agency specializing in film trailers in Los Angeles. After graduation, he moved into a full-time role as video editor. He now creates film trailers for major motion pictures and is based on the West Coast. Joaquin Sosa is a freelance photographer and videographer in Washington D.C. He was Sierra Club’s outdoor youth ambassador for 2012, blogging from around the world. Advertising executive Rachel Wyse started her career with Facebook in New York City. Steven Stauffer has filmed Drew Holcomb, for Nike and Under Armour, and more. While at EMU, he submitted his class photography portfolio to the Festival of the Photograph and was awarded a scholarship to study with National Geographic photographer Bill Allard. Steven’s work was shown at the Paramount Theater in Charlottesville to an international audience that included some of the best known photographers in the world. Katie Schmid runs the wedding photography business, The Commoneer. In a way, the Sony FS5s, A7R IIs and A9s, the Canon EOS 5D Mark IVs, the new LED lights – all are part of his own portfolio. “I am a scavenger,” he said. Instead of ordering pre-assembled kits of equipment, he orders just necessary components, often used instead of new but still perfectly functional and in great shape. “‘Used’ doesn’t mean much for a tripod that will last 25 years,” he said, pointing out a hefty one that new would have cost $3,000 but that he bought used – 16 years ago. I would like to add my appreciation for the excellent training VACA students have. Stephen Stauffer photographed The Washington Ballet as part of his internship through the Washington Community Scholars’ Center. TWB is still using his photographs. And, Londen Wheeler had the chance of a lifetime when he photographed President Obama’s visit to DC’s Capital Area Food Bank. Folks at CAFB still talk about Londen. Jerry lives in the intersection of his deep passion and the needs of the world. That’s what God’s calling is all about. I so respect his contributions.